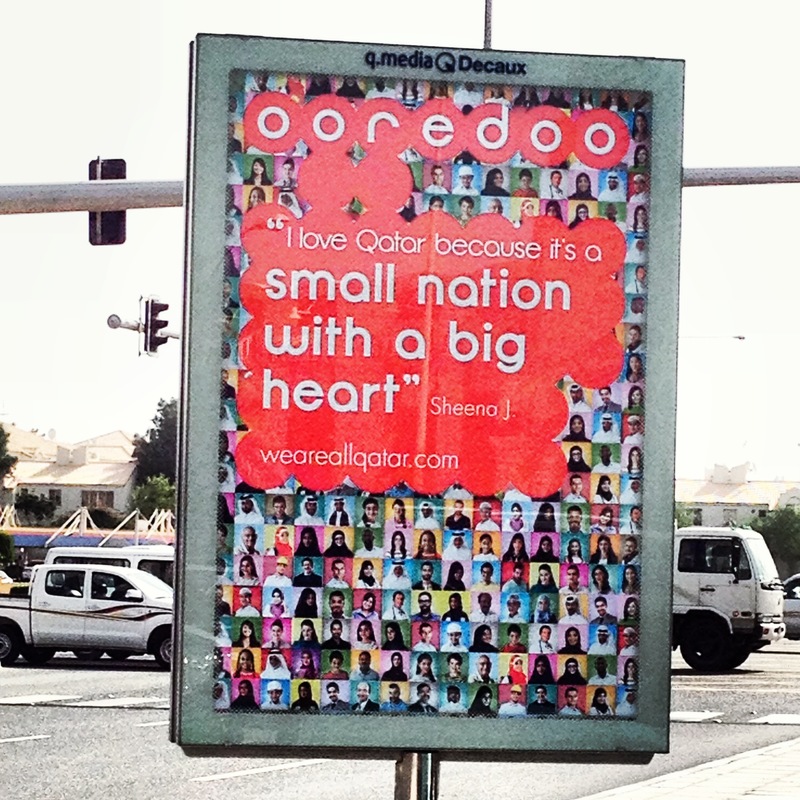 “Qatar: Small nation with a big heart.” That’s the Ooredoo slogan you can see on signs around the city of Doha. The visual is a friendly, colorful, multiracial society where we all get along. Recently, however, the atmosphere has been tense. Whether it’s the constant road work, squeezing the already congested main arteries of the city (and raising our blood pressure) or the increased scrutiny by the international media of conditions facing migrant laborers, raising questions about the fairness of the sponsorship system, even the uncertainty of a new leader and changes in policy life in one of the world’s safest countries seems tenuous. The mandate to override holiday, winter or Christmas festivals in schools because they may take away from National Day, celebrated on December 18th, contradicts the slick marketing promoting an easy plurality. This year’s National Day theme, “One Love” with a pair of hands intertwined, suggests others also know the different communities making Qatar our home need a little a morale boost. Perhaps even a visual reminder of how we relate to one another. This year the attack and murder of several young women, both of them school teachers, raises uncomfortable questions about the changing nature of this formerly sleepy city where you could go to bed with your front door unlocked. A few days away from National Day, I hope the residents of this country I call home, where I met my spouse, gave birth to two children, and used as the setting for three books, I know we can work together through these growing pains. This is my grown up Christmas wish. From laborers, to white collar professionals, to nationals, I hope we can continue to participate in conversation, actively listening, rather than growing more isolated in our specific perspectives. What about you? What are you wishing for this Christmas? her’e wishing your wish comes true. Thanks Jaya! Hope it’s a great end of the year for you too.